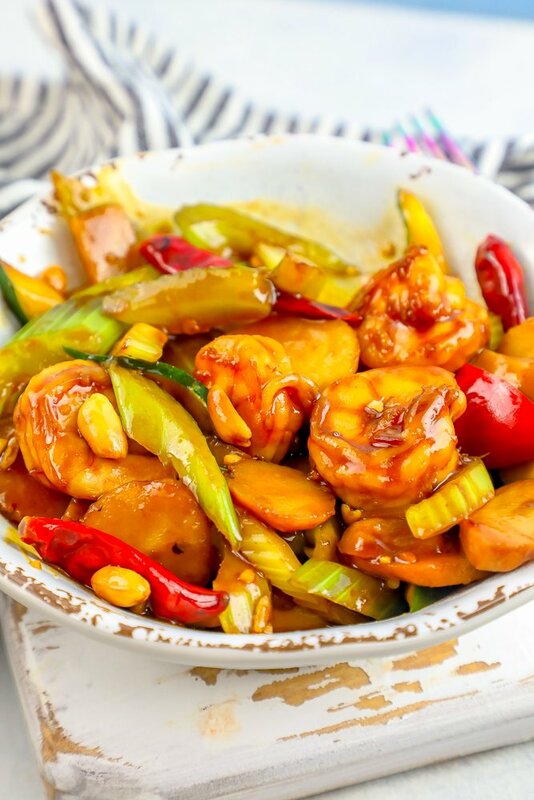 The Best Easy Kung Pao Shrimp Recipe – a Chinese Food Takeout Copycat -tastes just like takeout Kung Pao Shrimp from your favorite Chinese food restaurant – in half the time it takes to drive to get it, and a million times more delicious! 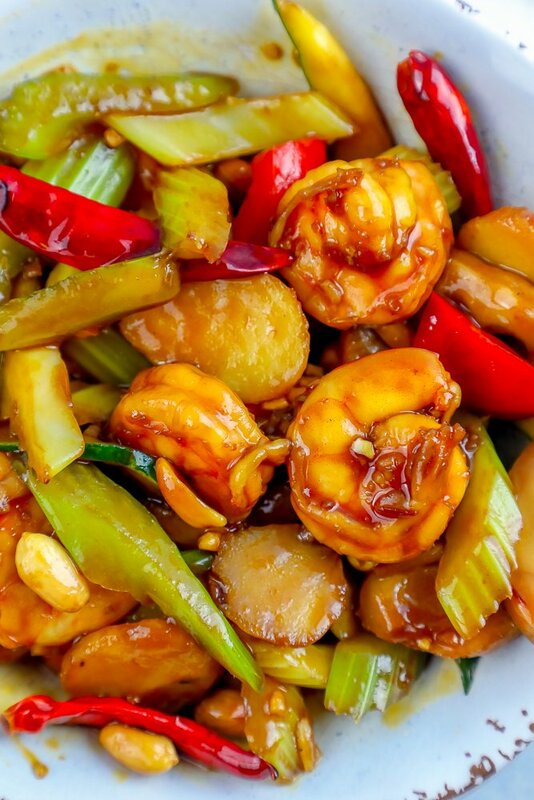 If you love Chinese Food Takeout, you’ve probably had kung pao shrimp – the rich, earthy, spicy dish loaded with flavor from shrimp, bell peppers, celery, water chestnuts, chilis, and crunchy peanuts! This dish is a class Chinese food takeout staple – and incredibly easy to make from scratch at home. It seriously is quicker to whip up a batch of this delicious kung pao shrimp than ordering takeout and driving to pick it up – and it tastes about a million times better! This easy, delicious kung pao shrimp recipe is simple, quick, and perfect for an easy dinner recipe – but bright and colorful, so it’s also great for a dinner party or Sunday supper. The best part about this easy kung pao shrimp recipe? 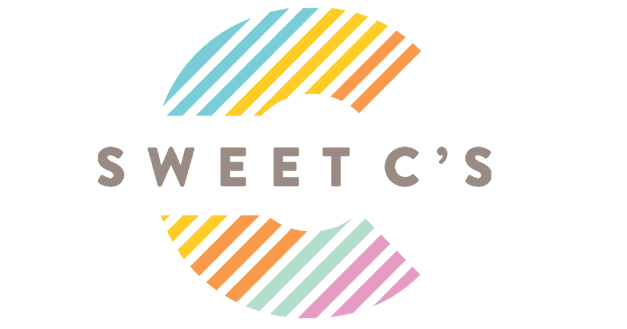 It can be make keto or paleo because it is a naturally low carb Chinese food dish…. 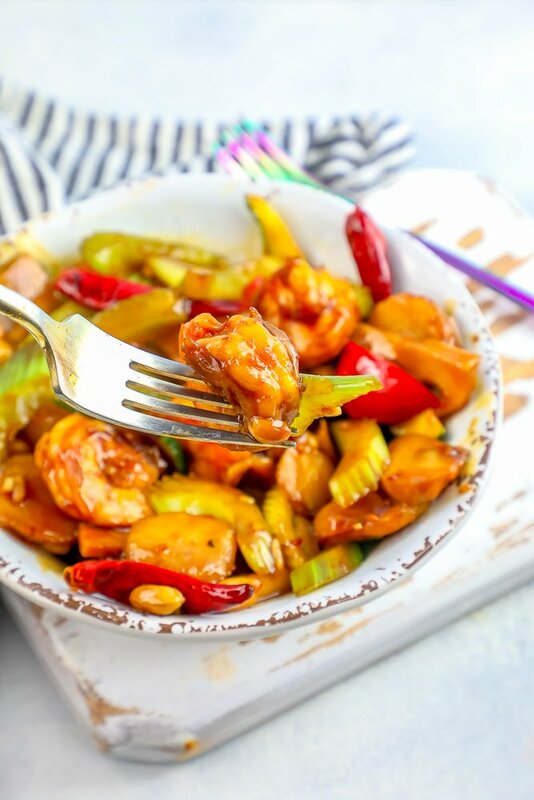 so if you’re watching your carbs, and missing Chinese food, this keto kung pao shrimp recipe is a perfect easy way to get your fix! 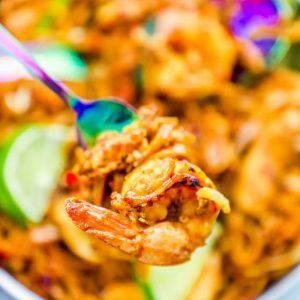 I’m including notes on making this recipe appropriate for a keto diet, so don’t skip them if you’re looking for a low carb kung pao shrimp! JUST TAKE ME TO THE BEST EASY KUNG PAO SHRIMP RECIPE ALREADY! If you’d rather skip my (very helpful, i think) tips and tricks, essential cooking info, and similar recipe ideas – and get straight to this deliciously easy Best Ever Kung Pao Shrimp Recipe – simply scroll to the bottom of the page where you can find the printable recipe card. 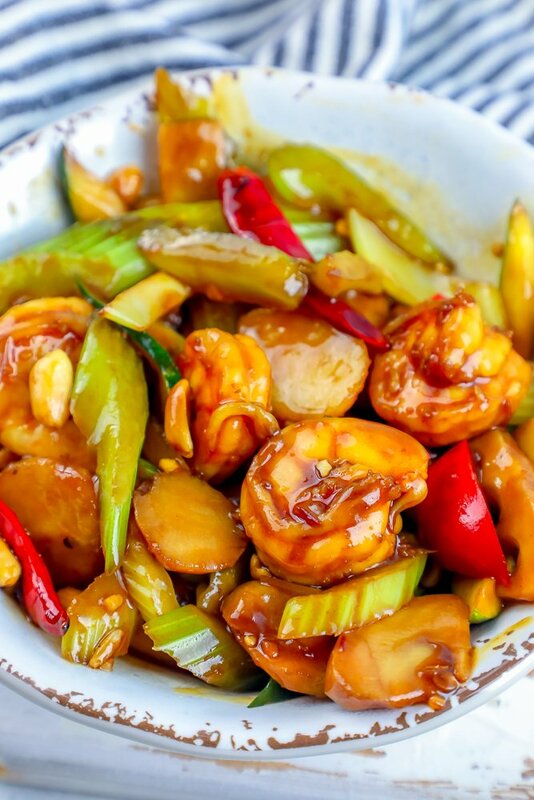 Kung Pao Shrimp is originally developed from the authentic Sichuan style Kung Pao Chicken – and features a slightly spicy and sweet taste that is similar to Chinese garlic sauce and full of earthy, garlic flavor. The dish is light, without noodles, but with a savory and rich sauce that is slightly sweet and totally addictive – especially over rice. 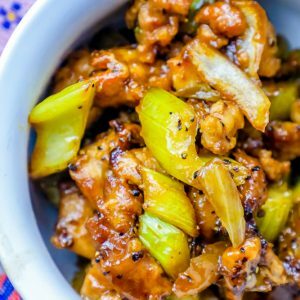 While Takeout Kung Pao Shrimp isn’t terrible for low-carb eaters, it is not specifically a keto recipe. 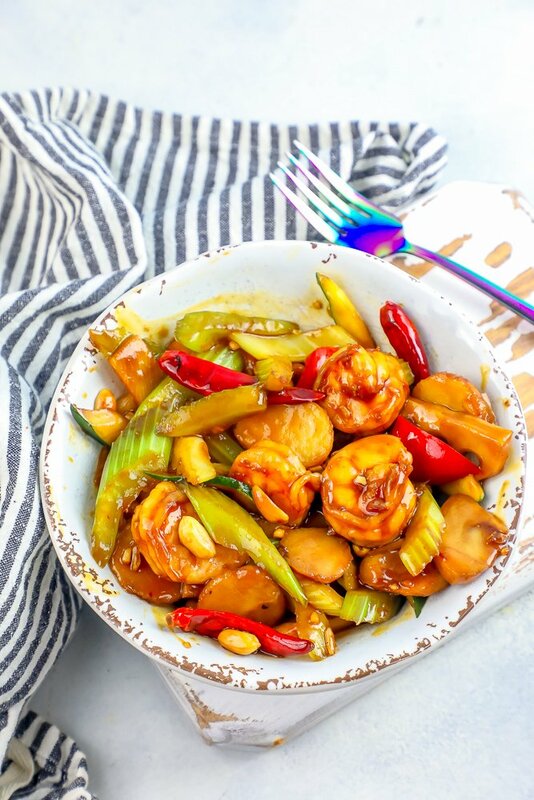 Thankfully, this Low Carb Kung Pao Shrimp recipe takes less time to make than it takes to call for takeout and tastes a zillion times better – making it the perfect paleo or keto meal! Kung Pao Shrimp is a dish consisting of mostly low carb items – just shrimp mixed with stir fried vegetables – but the sauce can hide carbs. To make a Keto Kung Pao Shrimp, swap soy sauce for Coconut Aminos, and skip the corn starch entirely. While this might make your sauce a little thinner, it won’t impact flavor – though many people on keto will go ahead and add the small amount of cornstarch since it won’t have a big difference in their macros as it’s such a tiny amount. The choice there is entirely up to you and your eating program! Shrimp is perfect when cooked just through – not overcooked. When many people say they don’t like shrimp, I often like to ask why they don’t – and many times, they complain of chewy, gummy, and overly fishy tasting shrimp – all things that are caused by overcooking shrimp. Shrimp should be cooked to just white and opaque – if it starts to curl in on itself, it is likely over-reduced and has lost much of the moisture that keeps the shrimp’s springy texture and light, sweet flavor. When cooking shrimp, remember to cook it hot and fast – just at the end of the dish. I like to turn the heat up at the end of preparing kung pao shrimp and toss in the shrimp and the sauce at the same time and toss them until the shrimp are cooked through and the sauce has thickened and slightly absorbed into the dish. This easy kung pao shrimp is great when prepped and heated with just a couple simple modifications. 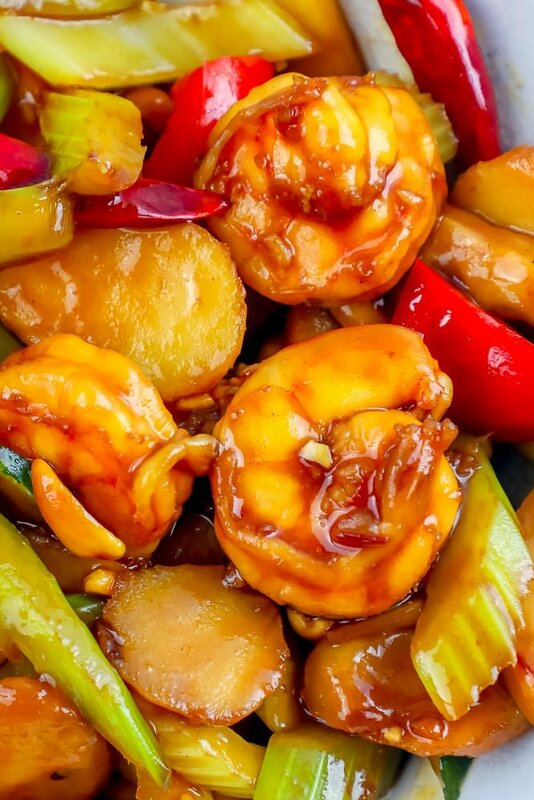 If you’ve made a portion of this shrimp you can’t finish and want to save for a later date, this Kung Pao Shrimp can be frozen and reheated for later – but there are a couple of tips to do it without making your meal turn to mush or having your shrimp turn tough. -Try to help bag lay flat so leftovers don’t freeze in a large ball shape – a thin, flat bag will be easier to reheat. -Add to freezer and keep for no longer than 2 months. -When cooking, remove directly from freezer, open bag and remove kung pao shrimp, and re-heat in a hot skillet with 2 tbsp oil (from frozen). -Cook until food is piping hot. -Do not overcook or over reduce. Freeze Kung Pao Shrimp Partially Prepared. The ideal way to freeze this meal is in separate bags – simply portion out the shrimp, but do not cook, and place in one bag in the freezer – and cook/prepare the vegetables and sauce, then store those in an airtigh bag in the freezer. -When reheating, remove shrimp from freezer and let thaw completely. -When shrimp has thawed, heat a large nonstick skillet and add 2 tbsp oil, swirl in pan until shimmery. 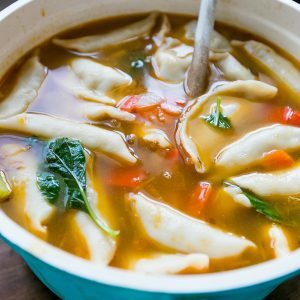 -Add frozen vegetables to pan and cook to almost hot – then add shrimp and sauce and cook until shrimp is white and opaque and vegetables are piping hot. -Do not over reduce sauce – can thin with water if needed. If you love this easy and delicious Kung Pao Shrimp recipe, be sure to check out some of my other favorite Asian Food Takeout Inspired recipes – simply click the links to find each easy printable recipe below! 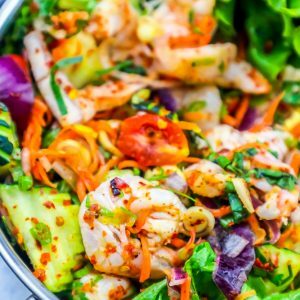 These easy Asian food takeout classics are family pleasing, affordable to serve a group, and bursting with your favorite takeout inspired flavors! If you love this Easy Kung Pao Shrimp Recipe as much as I do, please write a five star review, and be sure to help me share on facebook and pinterest! 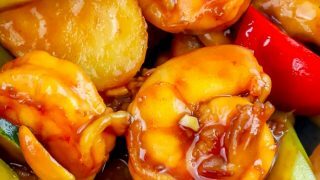 The Best Easy Kung Pao Shrimp Recipe - a Chinese Food Takeout Copycat -tastes just like takeout Kung Pao Shrimp from your favorite Chinese food restaurant - in half the time it takes to drive to get it, and a million times more delicious! Add bell peppers, celery, zucchini and hot thai peppers and sauté for 2-3 minutes or until slightly tender. (They will continue to cook with the shrimp and sauce). Add in shrimp and sauté until cooked through, 3-4 minutes. Add in garlic and water chestnuts and cook for 1 minute. Pour all of the sauce over the shrimp and bell peppers. Turn the heat down and allow the shrimp to simmer until the sauce is thickened. 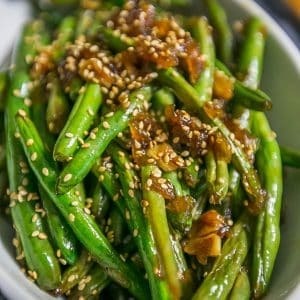 Serve with chopped peanuts, green onions and sesame seeds for serving, if desired. I love Kung Pao Chicken, but I’ve never tried it with shrimp. This looks seriously amazing!! 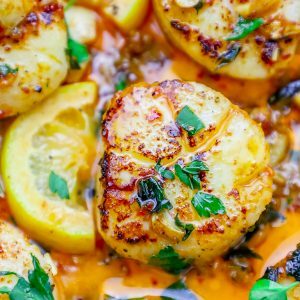 I’ve been on the hunt for some low carb meals recently, and this one looks DELICIOUS! Can’t wait to try it out! I think I’m going to make this tonight! It looks so good and I know my husband will love it too! I want to reach through my screen and grab a forkful. This is the best shrimp recipe!